Kerry Prosper, StFX's inaugural Knowledge Keeper on campus accepts an eagle feather from Terena Francis, StFX Coordinator for Aboriginal Student Affairs. 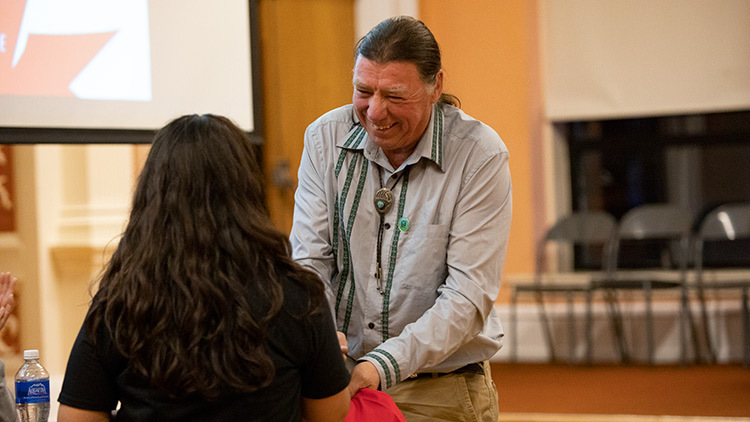 St. Francis Xavier University has named Kerry Prosper, a respected Mi’kmaw elder, published author and Band Council member from Paqtnkek First Nation as its inaugural Knowledge Keeper on campus. The announcement was made Monday, October 1, at an event on the StFX campus to commemorate Treaty Day in Nova Scotia. Terena Francis, Co-ordinator for Aboriginal Student Affairs at StFX’s Diversity Engagement Centre made the announcement on behalf of the university, noting Mr. Prosper’s long-standing work as a community leader. She also presented him with an eagle feather, a tremendous sign of respect and appreciation. “Eagle feathers represent honour in Mi’kmaq culture,” explained Terena. “They symbolize wisdom, honour, strength and trust, and to me, that’s Kerry. He has lived his life by the ways of Mi’kmaq natural law. In his role as Knowledge Keeper, Mr. Prosper will work with interested students, staff and faculty, offering wisdom and teaching about traditional Indigenous ways of being and knowing. He will maintain office hours on campus throughout the year and lead program opportunities like Learning Lodges, which will be offered on campus once a month, featuring Indigenous-centric content that’s driven by students themselves. Members of StFX’s Joint Advisory Council consulted with groups like the Confederacy of Mainland Mi’kmaq, Mi’kmaw Kinamatnewey, Paqtnkek Mi’kmaw Nation, and Pictou Landing Mi’kmaw Nation on the creation of the Knowledge Keeper position. Mr. Prosper was one of three featured speakers at the Treaty Day event, which saw a standing-room only crowd fill StFX’s Immaculata Auditorium. Contemporary Treaty Day was first acclaimed by Grand Chief Donald Marshall Sr. in 1986 after the Supreme Court of Canada Simon Decision in 1985, which affirmed the Treaty of 1752. Treaty Day promotes public awareness and education of treaty rights and obligations between Indigenous and non-Indigenous peoples. StFX students Cheyla Rogers and Justice Gruben began the evening with an acknowledgement that the event – and StFX itself – is housed on the traditional ancestral territory of Mi’kma’ki. The territory is unceded by the Mi’kmaq and Wolastoqiyik (Maliseet) peoples, and is covered by the Peace and Friendship Treaties of 1725. Cheyla noted that, despite strides made towards Indigenous/settler reconciliation, First Nations’ youth still face serious systemic disadvantages. For instance, they are 7 times more likely to die by suicide and 6 times more likely to be a victim of homicide than their non-Indigenous peers. Justice - who also offered Mi'kmaw and Wolastoqiyik honour songs - spoke about the importance of ongoing reconciliation work. Lindsay Marshall, poet and former chief of Potlotek Mi’kmaw Nation, was another of the evening’s featured presenters. He spoke about the need to understand treaties not just as documents signed by our ancestors, but as living, breathing agreements that guide our lives and actions today. He also noted his optimism that the youth and young adults of today will enact the changes required to move closer to full reconciliation. Cheryl Maloney, a prominent voice for Missing and Murdered Indigenous Women and long-time advocate for Mi’kmaq rights to natural resource protection, also spoke. She shared stories from her life of activism, including how she used her legal background and knowledge of Canadian constitutional law to delay the controversial Alton Gas project near Stewiacke, Nova Scotia. She also challenged attendees to do their part to uphold treaty rights. The event also included presentations and remarks from StFX students William McReady, Keeley MacCuish, Mariette Pique, Chelsey MacPherson, Monica Ragan, April Prosper, Ellen Byrne, Broderick Jackisch, and Katelynn MacPhee. All students are enrolled in Anthropology 332 Mi’kmaw Studies: Advanced Critical Issues in Indigenous Anthropology, taught by Dr. L. Jane McMillan, Associate Professor and Chair of StFX’s Anthropology Department.